Rudi Peterschinigg went one better than last time, to win his first FISTF satellite title at Harrow on Saturday, November 25. 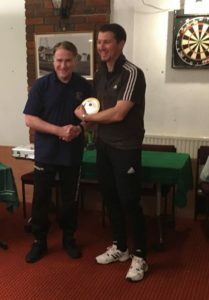 In the first international event hosted by the Harrow Hawks club itself – after previous editions hosted in the town by the English association – tournament director Peterschinigg overcame a slow start to the day, to deservedly take the honours, having been a losing finalist at the last satellite event. This time, the final, against teammate Victor Jones, was over as a contest within just 3 minutes thanks to two quick-fire goals, from identical positions from the right wing. A third strike before half-time ended the game as a spectacle. Jones had extended, but unproductive, spells of possession in the second half, and it was Peterschinigg who scored with a speculative, though well executed, shot on the move, before hitting another late on, to wrap up a more than comfortable 5-0 win. The victory was a perfect revenge for defeat to the same opponent in the first session of the group stage. There, Jones came back from a goal down, conceded an equaliser 50 seconds from the end, but still had time to lose possession after flick-off, to regain it, and then hit a winning goal, on the move, through a crowded defensive line, with the last flick of the game. That was part of a tough group, which was in the balance for all four players until the final session, with Peterschinigg needing a win, and both Terry Arnold and the returning Steve George also harbouring hopes of qualifying. As it was, following victories for Jones and Peterschinigg, Arnold and George went on to contest the plate final, the latter winning on shots. The group of second seed Martin Hodds, who beat Peterschinigg in the final of the last satellite in Harrow, was just as tight, with the Yorkshireman himself and Paul Andreas qualifying at the expense of Kevin Cordell, also returning after a break from the game. 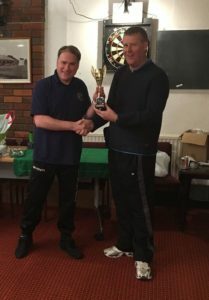 Peterschinigg got into his stride with a 7-1 hammering of Wolverhampton’s Mick Hammonds in the quarter-finals, before a 2-1 semi-final win over Hodds, in a game level in possession, but with the home player having more scoring opportunities. In the other half of the draw, Jones beat Dave Croucher in a nervy encounter decided by a single goal, whilst Andreas defeated Marco Ghigliotti 3-1, to ensure the host club had 3 players in the semi-finals. 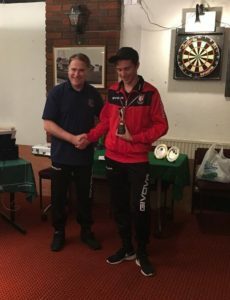 And it was Jones who emerged from a closely fought contest, coming back from a goal down early on, with a quick equaliser before a close range winning goal three minutes from time. But Peterschinigg would not be denied again, as a five-star performance in the final secured the tournament victory. 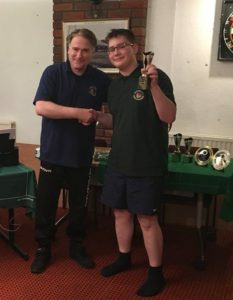 Kent Invicta’s Kye Arnold won the U19 trophy with victory against David Peterschinigg, who in turn took the U15 honours, beating Joe George 2-0 in a play-off.